ST-BM-02 Fabric Batching Machine with optional data collection and analysis system (4-point system) to handle a wide range of fabrics, especially for continuous process “A” frame batch and de-batch. 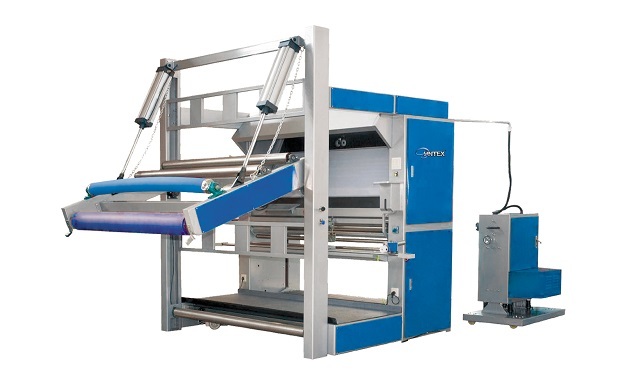 This machine can provide synchronised fabric input or output to “A” frame with constant tension control, with peripheral fabric contact for delicate or heavy duty fabrics. 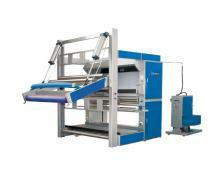 AUTOMATED CAMERA INSPECTION SYSTEM COULD BE INSTALLED ON FABRIC BATCHING MACHINES. Continuous process “A” frame batch and de-batch rolling machine, synchronised fabric input or output to “A” frame with constant tension control, with peripheral fabric contact for delicate or heavy duty fabrics. Surface winding and re-winding rolling machine for continuous process fabrics from big roll to small roll / big roll, with constant tension control, ideal for heavy duty fabrics. Continuous process fabrics from plait or small roll to "A" frame with constant tension control, with peripheral fabric contact for delicate or heavy duty fabrics. "A" frame fabric is unwound from non-contact centre drive system and wound by peripheral drive roller with pneumatically controlled arm, especially ideal for checking delicate or heavy duty fabrics. With Bow/Banana Roller to eliminate fabric creasing and roll distortions.